Many brands, big and small, have been giving their websites a stylistic refresh. These little touches can be simple tweaks to their logo and typography or added design elements that attract more attention, like illustrations and animation. There’s a reason for doing this and it’s quite simple; users are attracted to good design. Users respond better to a well-designed website. We all know this intuitively when we’re searching for something on the internet; we are more likely to stay on a great site for longer and finalize purchases when the site is well-designed. And design trends seem to change every couple years. The list below is our look into the 15 creative website trends for this year. Many of these will be in style for quite some time, just because of their user-friendly ways. So, we encourage you to read about them and see how your site measures up (examples included). Web pages usually have a grid structure with squares and rectangles that give a sense of stability, but can feel clunky, too. Organic shapes are irregular and asymmetrical, providing depth to make page elements stand out. These elements are drawn from nature itself and develop a visual flow. Those styles from years past never went away—they went underground. Experimenting with nostalgia finds the juxtaposition between the old and new. For many young people, retro designs can feel new or unique. Retro design elements can make a brand standout. Pages don’t have to be on a grid anymore. It’s easier to make them more asymmetrical and it’s becoming more common to see out there. This pushes the boundaries of design, which helps draw more attention. Companies looking for depth to their design should take a serious look at 3D and iconoclastic illustrations. The creative potential illustration brings can extend a brand outside what their competition is doing. Integrated video captures the audiences attention quicker than text. It also boosts SEO ratings, because users spend more time on the page. Video is strategic. Much like asymmetrical designs, overlapping elements can bring more emphasis to content on the page. It also makes pages look more three dimensional when boxes are layered. Experimentation with navigation isn’t a new thing. So, websites choosing to push the boundaries with their design should look at making their navigation very large and the focal point of their site. Better writing, such as storytelling, will keep visitors on the page. This is also a strategic move. More companies are looking for an emotional response from their marketing and this is definitely a great way to get it. The style, arrangement, or appearance of letters on the page matters. Serif fonts create elegant titles and sophisticated headlines. Some can be retro with a modern twist. The text does the talking. It’s a headline they can’t ignore. Much like large navigation, this design makes the message the focal point and it should also entice users to investigate. This is not an exhaustive list. There are other design choices on the front end that draw users in, and on the back-end there are ways to enhance performance, such as programming and plugins. However, some of these backend adjustments tend to require complete overhauls, depending on your current developer’s method. Some of these are best to add when you are completely redesigning your website, which you should consider doing every 3-6 years. Our examples above are supposed to spark your imagination, hopefully showing you a few tweaks that may increase traffic and conversions on your website. Let us know which ones are on your wish list. Over the past decade, we’ve experienced first-hand how building a website has become more complicated. This has been a journey for all designers and developers because it seems like something new happens every year to change the course of development. Yet, wireframes are still used to show the general layout of a site and user flow still describes where traffic tends to go. It’s good to know that some things are still the same, even though mobile apps and smartphone navigation have changed the way we create a positive user experience. We have to do some homework before we can get started on those wireframes, because we need to see how potential clients will interact with your site. What is their goal when they get there? Are they searching for information or do they need help right away? Answering these questions can help us enhance their experience. The site needs to be accessible and easy to use. Is it disability-friendly? How long will it take to load on-screen? It needs to connect immediately with the user and their motivations for being there. They should be able to quickly locate and navigate to areas of the site that are relevant to their needs. Five years ago, personal computers still dominated the market, but are losing traction quickly. Today, smartphones are now considered the gateway to the internet. Consumers access media and shop online more than ever. A company’s website has to be mobile responsive, or else it will lose potential business. Plus, Google lowers search results if the website is not optimized for mobile. The best way to engage potential clients is through visual design. It communicates faster than words and solidifies the company’s brand through logos, icons, colors and texture. If this is their first impression of the company, it needs to consistently represent the brand while providing information. Visual design should improve navigation, not hinder it. When a site is overtaken by too many visuals it gets bulky, especially on a smartphone. As a result users struggle to ignore the constant stream of images. Best thing to do is to strike a balance between recurring brand images and visuals for ease of navigation. A website needs to do more than just capture attention. It has to sell the brand. The best way to do this is through intuitive design, engaging visuals, and content that motivates. Website content needs to talk about solving problems. In some way, the site has to make visitors’ lives better, which means clearly identifying common challenges and how they get solved. Having a list of features and benefits doesn’t sell unless the “Why?” is there. Same goes for awards. These need to be explained in a way that makes people want to learn more or call. To design a site from the user’s perspective takes time and some research, but it will increase engagement and funnel in more business. Connect with us if you have an upcoming web project and we’ll see how we can help! The vast majority of Pinstripe’s clients are professional services firms – law, healthcare, architecture, technology, consulting, etc. Over the years, we’ve become pretty good at developing brands and crafting messages that work in those industries, but every once in a while we get a project that falls outside the norm which gives everyone a little shot of adrenaline and inspiration. The latest example is the rebranding of Ginger’s husband’s “retirement hobby” – a cigar bar on the beach. When he purchased the bar, it had nine years under another name that we thought had a more retail connotation instead of a lounge to enjoy a fine cigar and cold glass of local craft beer. 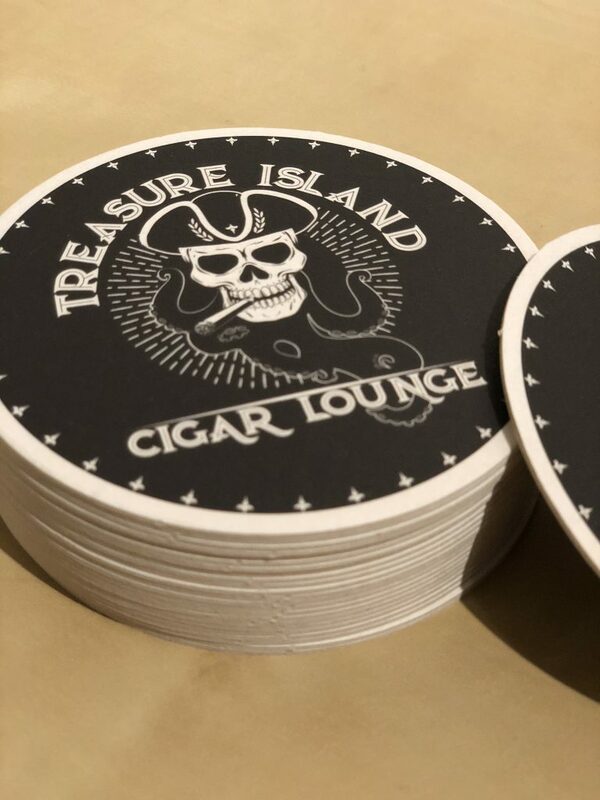 For a fresh start, and to highlight the lounge and to make it more ‘on the nose’ about the location (particularly for tourists checking Google), it became the Treasure Island Cigar Lounge. The logo was the fun part. 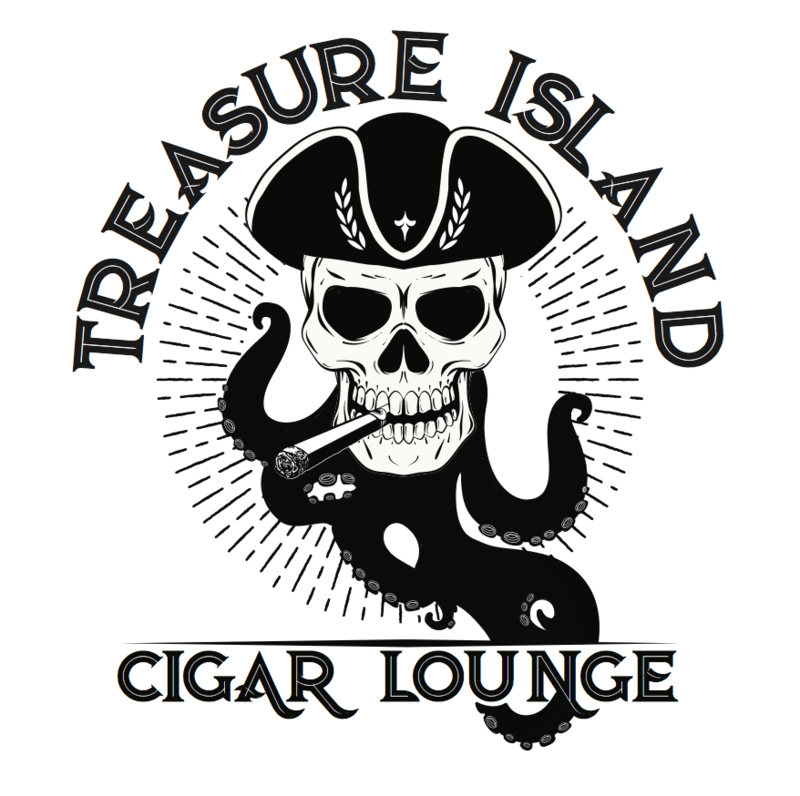 Taking inspiration from local pirates, tattoos, a slight reference to his epic goatee, and Ginger’s fondness for octopuses, we developed a final, iconic brand for the lounge. We don’t have many opportunities to work on consumer-facing, retail brands, so we enjoyed the creativity that comes with a fun project like this. So far, the logo appears on the web site, social media, menus, signage, stickers, coasters and t-shirts, but we’ll soon be producing ads, event materials and more. We’d love to see it as a mural! Let us know if we can help you with a fun branding project!